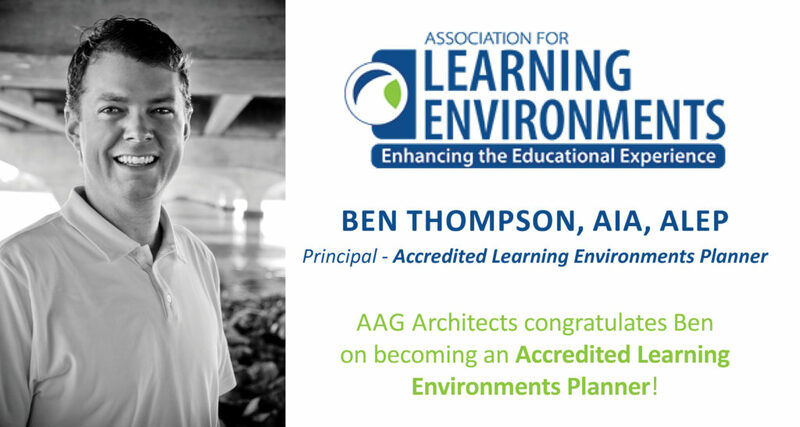 AAG Architects is pleased to announce that firm principal Ben Thompson, AIA has received the Accredited Learning Environment Planner (ALEP) designation. The ALEP credential stands as a mark of excellence and was designed to identify those in the educational design field who demonstrate the knowledge and abilities essential in developing high-quality, effective 21st century learning environments. Ben is the one of a limited few to achieve this designation in the Southeast. Over the last year, Ben completed the requirements for this accreditation through San Diego State University and the Association for Learning Environments. The Association for Learning Environments (A4LE) was established in 1921 to advocate for effective educational facility planning, design, and operation. Its sole mission is to improve the places where children learn. A4LE has a presence throughout the United States as well as Australia, Southeast Asia, and the UK. To learn more about this organization, visit www.A4LE.org. 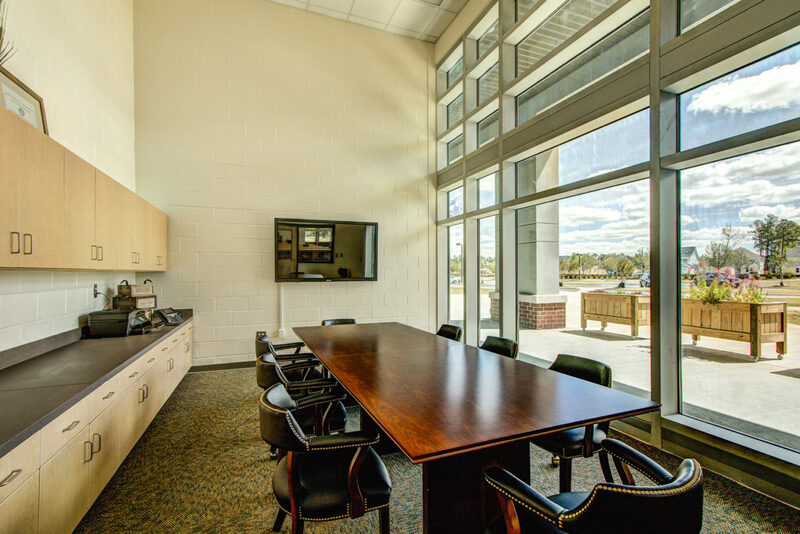 AAG Architects continues to focus on K-12 educational facilities throughout South Carolina. In his role as firm principal, Ben works with schools and districts on planning, assessment, programming, and design for school projects and large building programs. 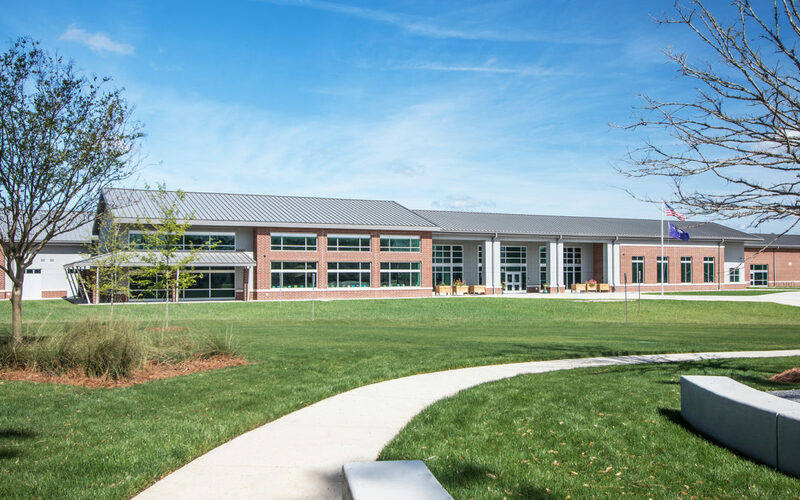 AAG Architects is extremely proud to serve Dorchester School District Two’s Sand Hill Elementary School project at Summers Corner. The district is the only local district that received an “A” in federal ratings in 2015, and is considered one of the best educational programs in the State of SC. This brand-new, state-of-the-art facility reflects that excellence in education. “Learn, Grow, and Serve” defines Sand Hill Elementary School’s instructional focus. To achieve their goals, the school utilizes state of the art technology and equipment, as well as the beautiful nature of the surrounding Lowcountry. The natural landscape was strongly considered while designing SHES. The faculty and students have access to nature trails, community parks, and multiple recreational areas. A respect for nature is an important part of the SHES curriculum. The building was conceived to encourage student interaction and collaboration while providing a hub for the surrounding (and growing) walkable community. At Sand Hill Elementary School, technology is infused in the educational process. 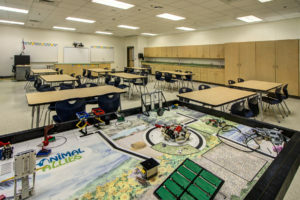 The school also has an engineering lab and a robotics team, allowing students to learn valuable STEM concepts that they can apply through all aspects of life. And soon to come is a Tinker Lab, a resource that will allow elementary students to deeply engage in science and engineering. 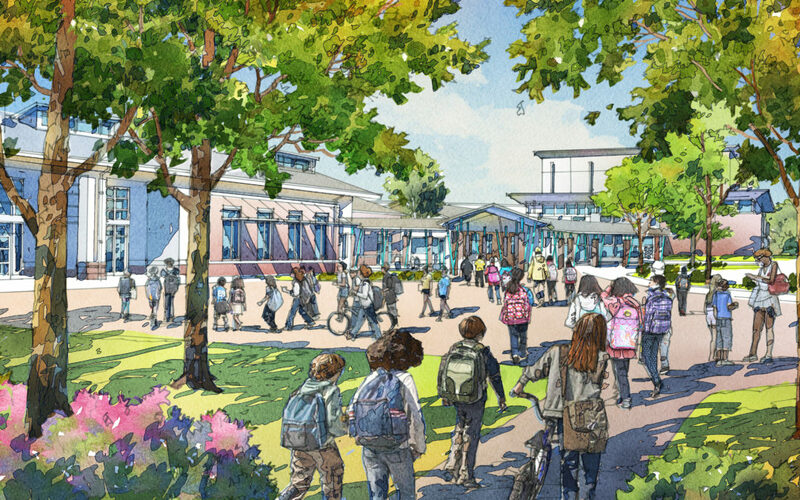 AAG Architects is very excited to follow Sand Hill Elementary School’s journey. We are proud to help contribute to this excellent educational program and be a part of the Sand Hill Elementary School family. To learn more about this project, visit the local Summer’s Corner blog. AAG Architects lives by the notion that “It’s not just what it looks like and feels like. Design is how it works.”* In developing the design of a building and relating it to the world around us, every detail matters. Our team looks at all of the influences that might affect the shape and form of a project: whether that may mean conservation of the land, understanding the history of a site, or its connection to neighboring areas. But, design also means more than just the physical and technical development of a project. Design almost always means looking at outside influences: health, politics, art, science, technology, you name it. Each project is unique, and it’s our role as Architects to bring it all together – to make it work. Bringing different points of view into our design process influences the final design and tells a project’s unique story. 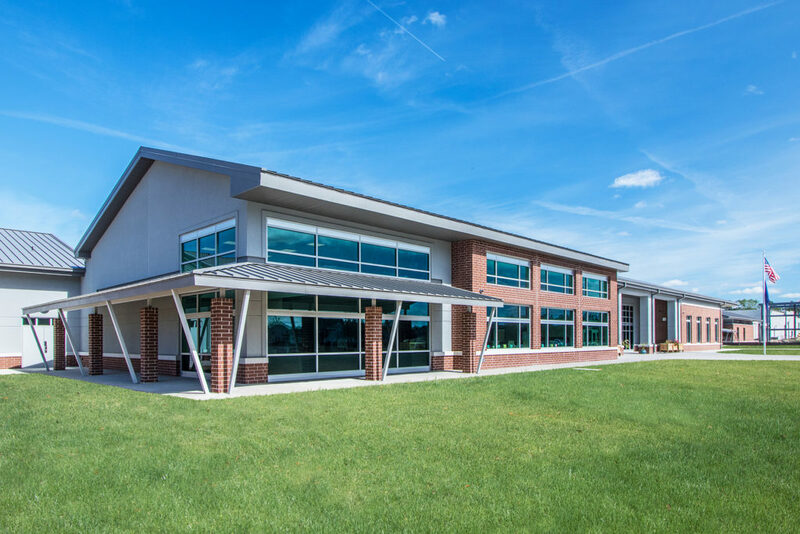 The new Sand Hill Elementary School and the new Rollings Middle School of the Arts have a unique story to tell. These two schools are the springboard for the new Summers Corner development in Dorchester County. 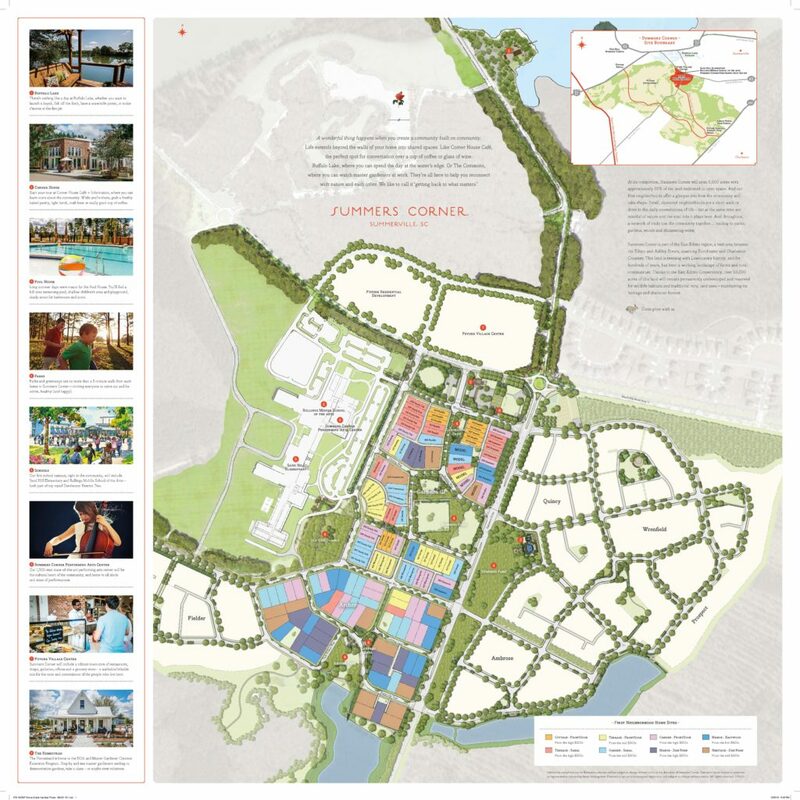 Summers Corner is part of a 76,500 acre master planned development, East Edisto, by WestRock (formerly MWV). Over the next several decades, this area of the Lowcountry will develop into a network of small communities, with Summers Corner as the first of these communities. The area has had a history of farming, hunting, and isolated rural communities. The story of Summers Corner is one that balances the rural character of the area with living, learning, and working in this growing part of the state. Summers Corner Development Plan. WestRock. 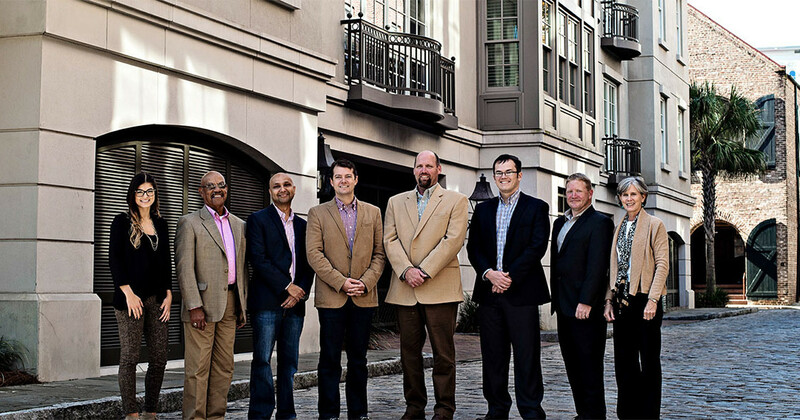 As part of the team serving this effort, AAG collaborated with the land development team, urban planners, and landscape architects to focus on just how a community should grow. We looked at Lowcountry South Carolina towns, how they grew and what influenced their development in the past. We took our cues first from the small rural towns in the area as well as Summerville, Charleston, and Beaufort. These influenced the design of Summers Corner: developing gardens, parks, and neighborhood paths. Creating networks to connect neighbors to outdoor pavilions, shopping and dining, recreation, performing events, and schools. In the end, setting the stage for an active, social, and Lowcountry community with its own unique identity and it own story to tell. Sand Hill Elementary School Rendering. Urban Design Associates. 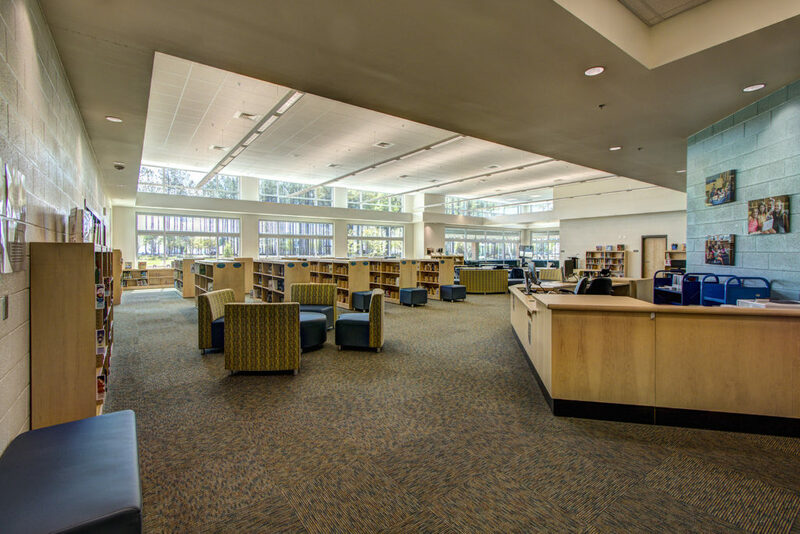 The design of Sandhill Elementary School and the new Rollings Middle School of the Arts brought all of these masterplanning and development ideas together. The elementary school portion of the campus aligns with pedestrian greenways and includes an outdoor “Helix Oak” park shared by the school and the community. The elementary school is located close to residential areas of the neighborhood, allowing students to walk and bike to school. The middle school has a nationally recognized Arts program that attracts students from throughout the county. The new Rollings Middle School of the Arts also includes a +1,000 seat performing arts theater, located on the campus to provide broader area access. It is surrounded by commercial and retail properties. The overall campus is both a destination and an integral part of the neighborhood’s network. Summers Corner Performing Arts Rendering. Urban Design Associates. The schools share drives and services, but the buildings each have their own unique set of needs and influences. The elementary school is marked by the scale of the neighborhood with one and two-story academic villages. Sand Hill Elementary School has a strong relationship with the outdoors. 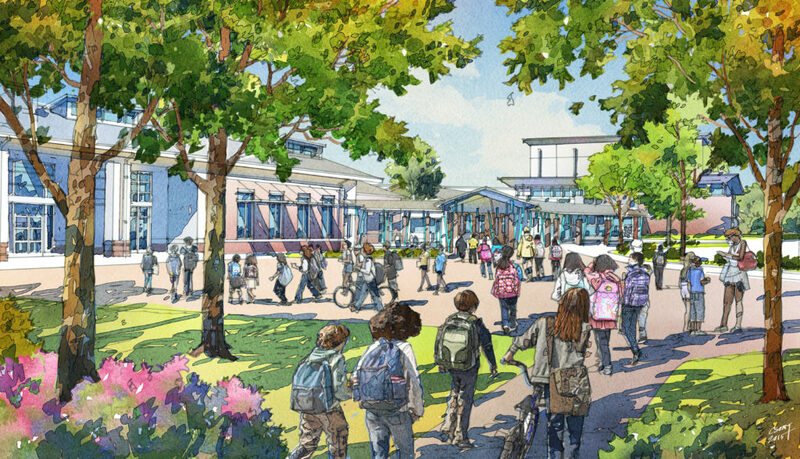 The school’s main entry, media center, and activity spaces are envisioned to correspond with neighborhood walking paths, gardens, and greenways, providing both indoor and outdoor learning environments. The middle school’s focus on performing and fine arts builds to a much different monumental scale. The school’s focus is one of arts infusions and 21st century learning. The performing arts theater and the gymnasium will be used both during school and after hours. These areas have their own independent entry. 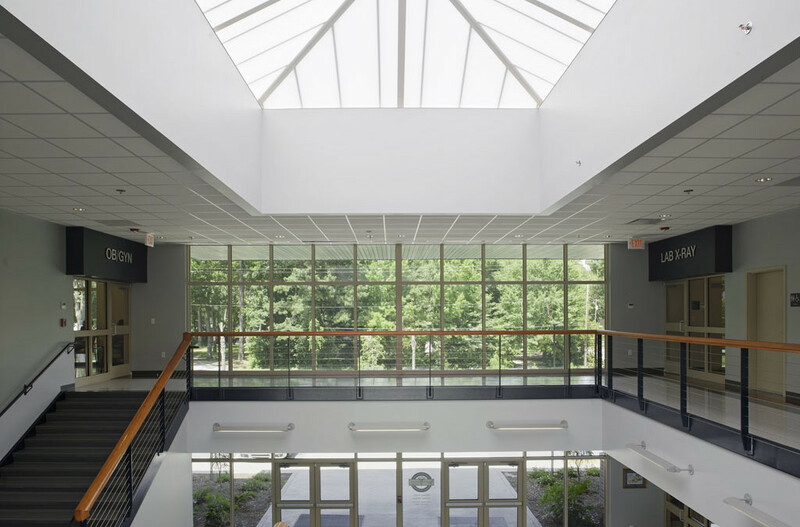 Performance and multi-functional spaces are located throughout the two-story school, giving many opportunities for small and large student interaction to support its middle school curriculum. 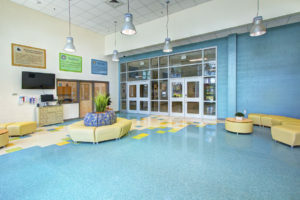 The new Rollings Middle School of the Arts connects the arts classrooms, theater, athletics, and instructional areas together. Making it work is what AAG Architects does. Every project has its own set of influences, its own unique story to tell. Sand Hill Elementary School and Rollings Middle School of the Arts are just beginning to tell their story, as years of collaboration with the Dorchester School District Two, WestRock, and the broader community are coming to fruition. There’s more to come, so visit back with us or connect with us. We’d be pleased to share much more about these exciting projects for the area. * Walker, Rob. “The Guts of a Machine.” The New York Times, November 20, 2003. Julia Deckman joined AAG Architects as the Charleston Office Manager in November of 2014. Julia is originally from Annapolis, Maryland and was previously a retail store manager. She also has several years of administrative experience and helps to keep us organized and on track (which can be trickier than it sounds). Julia is our office manager by day, and an artist by night and weekend. 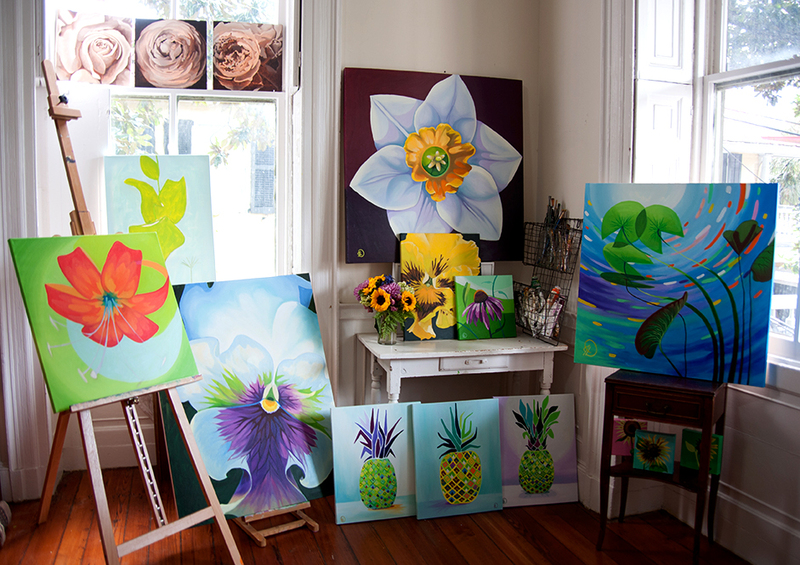 She launched her local art career in the beginning of 2015, and has had a few public showings since. 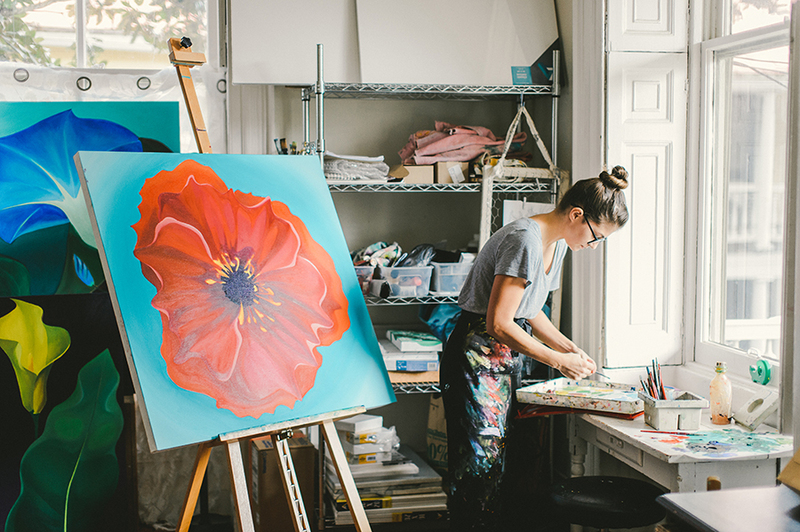 She most recently became a studio artist at Redux Art Center and will have her small work-space up and running next month. Her latest series, Charleston Hospitality, celebrates the outstanding restaurant industry we enjoy here in Charleston. The series will be released during a happy hour pop-up shop at Candlefish here in downtown Charleston on Friday, June 3rd. Julia will be selling her original pieces, along with prints and special edition note card packages. There will also be complementary beverages and a raw bar provided by 167 Raw, so even if art isn’t your thing, the show will be worth a quick visit. 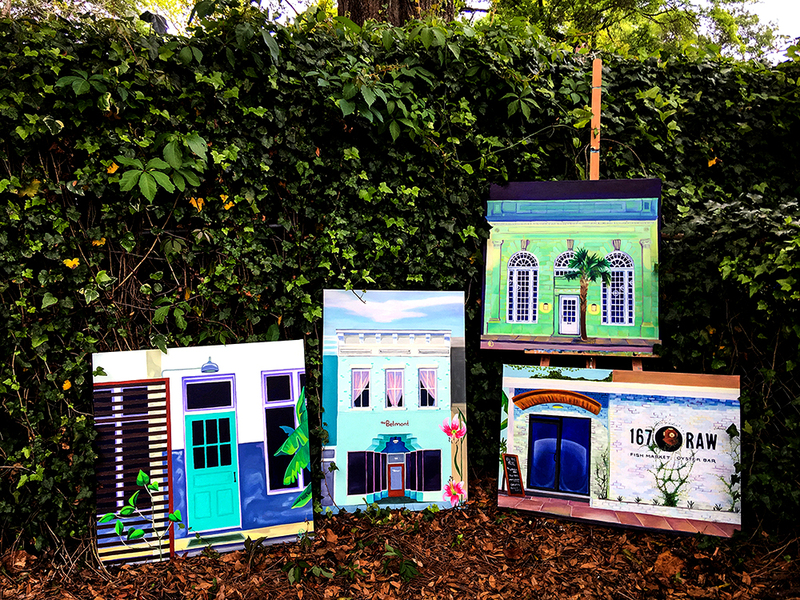 If you aren’t able to attend the pop-up shop on Friday, Julia will also be live painting during the grand reopening of Colonial Lake in downtown Charleston on Saturday June 4th. The event is from 10:30am – 2pm, and there will be several activities for people of all ages. We are happy to give Julia a break from her work in the studio here at AAG Architects. Welcome to the new AAG website. We are making a much needed update to show what we’ve been working on for the last several years. AAG has always been about Architecture, Planning, and Design. So as part of our update, we are dropping the “Associates” (vague) and changing our name to “AAG Architects” (accurate). We have improved our website content and navigation. You can also find samples of our recent projects, information about our team leaders, and a simpler way to contact us. Located in Charleston and Beaufort, AAG is focused on K-12 educational projects regionally in South Carolina. We are also involved with our local communities on medical, higher education, commercial, athletic, and municipal projects. For more than twenty years our philosophy has remained consistent: SERVE our clients by listening first. DESIGN with a deep understanding of need, place, and resources available. LEAD by being responsible for the commitments we make. Please take a look at our new and improved website. Let us know what you think or how we can help you!